It was only a matter of time, wasn’t it? 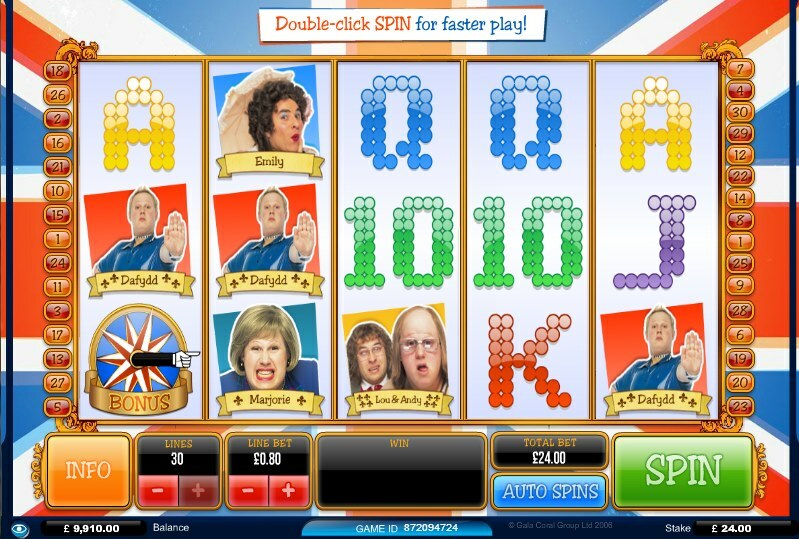 One of the most popular UK TV comedy shows in years has finally arrived on the slots market courtesy of those clever minds at Ash Gaming. For those of you familiar with the likes of Vicky Pollard, Andy and Lou and Dafydd (the only gay in the village), created by David Walliams and Matt Lucas, you will know what to expect. If you are not familiar with these weird and wonderful characters then you might want to brace yourself for a very surreal slots experience. 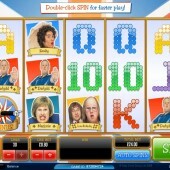 Little Britain is a 5-reel, 30-payline slot that will satisfy every fan of the BBC series, with most of the programme's notorious characters on the reels in gory photo-realistic detail. Trigger the Little Britain Bonus by landing the Bonus symbol on Reels 1, 3 and 5 simultaneously, and you will trigger the game's big selling point. Everyone's favourite teen Mum - Vicky Pollard - is the subject of the first bonus game, the ASBO Bonus (if you're not from the UK, ASBO stands for 'Anti-Social Behaviour Order'). You have to give Vicky a selection of activities to choose from such as joyriding or going to prison, and the longer Vicky debates which activity she wants to do, the bigger your prize. You can win up to 750x your stake during the feature. Welshman Dafydd - the only gay in the village - is the star of the Big Gay Bonus. In this feature, you must shuffle Dafydd three times to put him in different clothes and attract other gay guys (hey, we never said this game was politically correct). If you complete a costume then you will win a prize, with a potential 500x stake jackpot up for grabs. Matt Lucas's gross weight-loss guru, Marjorie Dawes, is the star of the Fat Fighters Bonus. Here, you must select silver trays to reveal food. The unhealthier the food you unveil, the more the calorie meter rises. Once the meter is full, the feature ends and you'll be sent back to the base game, so it's important to find the healthiest foods possible. The Edwardian drag artists, Emily Howard, fronts up the Lady Things Bonus. Another Pick'em bonus game, just pick items from Emily's room - find more "feminine" items and win cash and multipliers. There's a nice jackpot of 500x your total stake, as with the previous bonus rounds. Finally, the Lou and Andy Love It Bonus is the fourth Pick'em bonus on offer. Select items for Lou to pass to his fussy wheelchair-bound chum, and if he likes them you'll win cash. There's a pretty tasty jackpot of 1,000x your total stake to be won. The madness does not finish there. There is also a free spins bonus round that is triggered if you hit three Little Britain Free Spins symbols on Reels 2, 4 and 5. You will be awarded 10 free spins but during the feature there are special Stacked Wild characters introduced for bigger wins. If you remember the show, you won't have forgotten the bonkers Anne who leapt onto the screen with a manic screech before disappearing. When she appears on the screen here, Anne will toss certain items at symbols to turn them Wild. Little Britain offers fans of the series plenty to savour. It might be a bit leftfield for some slots players (especially those who aren't familiar with the show) but the wide range of bonus features is worth giving it some time and patience. Ash Gaming has already got some popular slots to its name, including the fairytale-themed Alice’s Wonderland and the 100-payline slot Amazon Wild. This release only increases the reputation of this underrated developer further.